Office Space - Stratford upon Avon, Warwickshire. 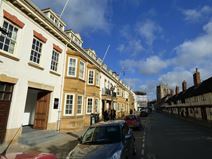 In a beautiful, unique, character building with car parking this outstanding office space is located in Stratford-upon-Avon Town Centre. The newly refurbished office space is a mere five-minute walk from the train station. On-site amenities include administrative support, air conditioning, office cleaning, ready to go Wi-Fi, reception services and the space is also accessible by tenants 24-hours a day.